MS Backup Recovery - A Great Tool to Repair BKF File! The company has been designed a windows backup recovery software with the ability for repairing unlimited number of severely corrupted BKF file. This extremely critical process of recovery is served with immense amount of speed and ease. With support of MS backup recovery tool, you can overcome corruption of their backup data within few clicks that are absolutely understandable. The MS backup recovery software is instilled with a number of highly technological lineaments that sum up to offer a fine recovery of backup data. Quick Scan: You can quickly scan your data with the help of quick scan option offered by our MS backup recovery tool and quickly restore windows backup file without looking any bad error message. Quick scan option offers a single phased scanning of your inaccessible data in a swift process. Lower level of corruption cases can be dealt with the help of quick scanning option to wrap up the process in a short time. Deep Scan: The Deep Scan option lets you carry out scanning and recovery of data in the most thorough manner. This scan procedure is absolutely suitable for critical corruption cases and when you want to repair your data entirely.Then apply to deep scan process for repair corrupt BKF file which is easily to recovers completes data immediately. Range Scan: Via the Range Based Scan option you can tackle any level of corruptness from the affected BKF file. The specialty of this scanning option is that you can select a date range; data falling under which has to be scanned. This way you don’t have to scan and repair the entire data stored within your backup file but can particularly select a ranged data to be recovered. Option To Search File: With MS backup recovery solution you can get the capability of not only repairing the backup files from any causes of corruption but also of searching particular files stored within the BKF. Preview Contents: When you use our highly capable and technologically sound BKF Recovery application you own the ability to preview the contents been repaired by the windows backup file repair software. A backup file consists of a number of files backed up in it and after scanning you can preview them before saving the repaired copy. 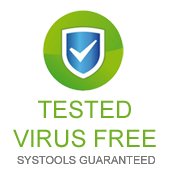 Key Benefits - MS Backup File Recovery Tool with Both Formats! 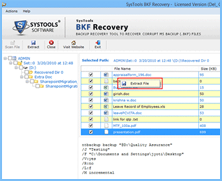 Freeware Provision: With the trial version you can repair and preview the items recovered by the BKF Recovery application whereas you cannot save them. Licensed Activation: Meanwhile, using the licensed edition of MS backup file recovery tool lets you repair, recover and save the data to your system after previewing it.